Shaun Hill is not some back-country monk. And his brewery isn’t set up for a two-page spread in Kinfolk magazine. But based on the stories written about this isolated brewery on a hilltop in northern Vermont, you may have gotten that impression. Or you may be getting that impression now — the images don’t lie. But there’s a lot more to this place, and this brewer, than the aesthetics of it all. Looking past the verdant landscape and the piercing look in Shaun’s eyes, there’s just a tireless 30-something with more guts than cynicism, an obsession for making beer — and he’s using his family’s barn to brew it in. Since being named “Best New Brewery" in the world in 2010 by Ratebeer, and applauded again in 2012 as the “World’s Best Brewery" outright, journalists of all sorts from The New York Times to Vanity Fair have been making the long car ride north towards the Canadian border. 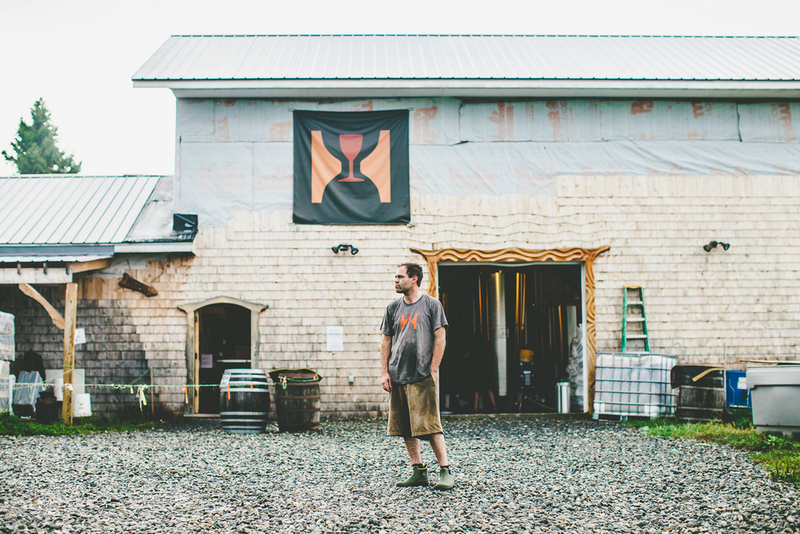 And every day, he gets interview requests and inquiries from other media outlets looking to tell the Hill Farmstead story, using it as the poster child for what’s so fascinating about artisanal beer culture in the US. But lately, Shaun is disappointed, even embarrassed, by the characterizations. On first glance, Shaun has the quality of an artist too distracted by his canvas to see the outside world. He looks like he hasn’t slept in days. His eyes jump between the crowds and the control panel. His thoughts get jumbled between trying to answer questions and the squawking from his cellarman on the walkie talkie in the pocket of his cargo shorts. Every spare moment in the brew cycle is spent hosing down fittings and re-setting timers. His intense concentration can translate as indifference, and his busyness as eccentricity. From the articles written to-date, one gets the sense that New York hasn’t encountered anything this “authentic” or “artful" since Clement Greenberg presented Jackson Pollock. But Shaun didn’t pick this place because of any neo-pastroal fantasies about life in the county. This is where he grew up. It’s his family’s land and he wants it to stay that way. Logically, it’s a terrible location for a brewery. Breweries moving into industrial parks and warehouses in the world’s largest cities often have to upgrade the water lines and voltage output just to get up and running. Managing the amount of water, electricity, temperature control and sanitation required to run a brewery of this caliber, in a location as remote as Hill Road, is a challenge even the most seasoned of brewers would decline. “If we suddenly realize we need a part, or the roads aren't passable enough for UPS, we’re screwed,” says Shaun. When it comes to the beer, they certainly speak for themselves — they’re nuanced, flavorful, spectacular beers made with a delicacy you can see and taste. And they’re often low in abv, which flies in the face of so much conventional wisdom. “I made them that way because I knew — the people around here would all need to drive to get the beer. We have to drive to get anywhere up here. This way, they don’t have to worry about drinking a couple when they stop in to visit.” Again, Shaun’s thinking about the system. 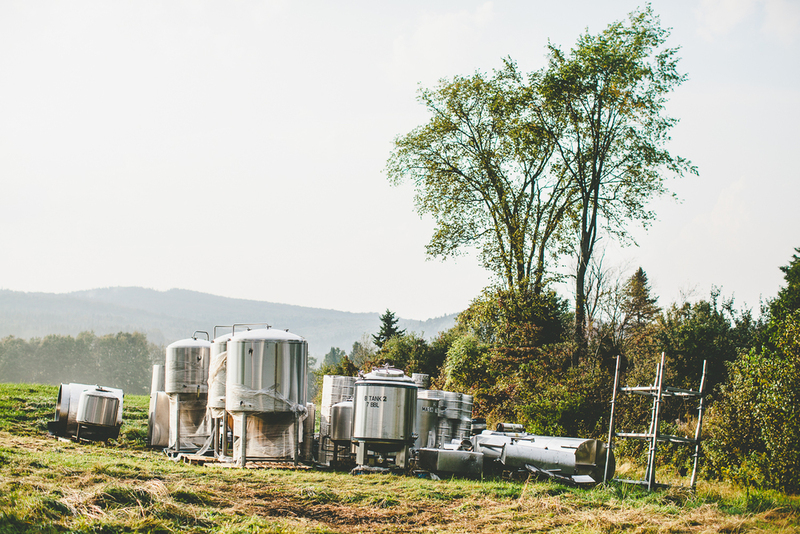 Despite the heady titles of his beers, often riffs on philosophical texts, the specialness I see in Hill Farmstead is less about any lofty, philosophical ideals than the need for control and perfection dictated by his choice to brew beer, here, on this dirt road in Vermont. 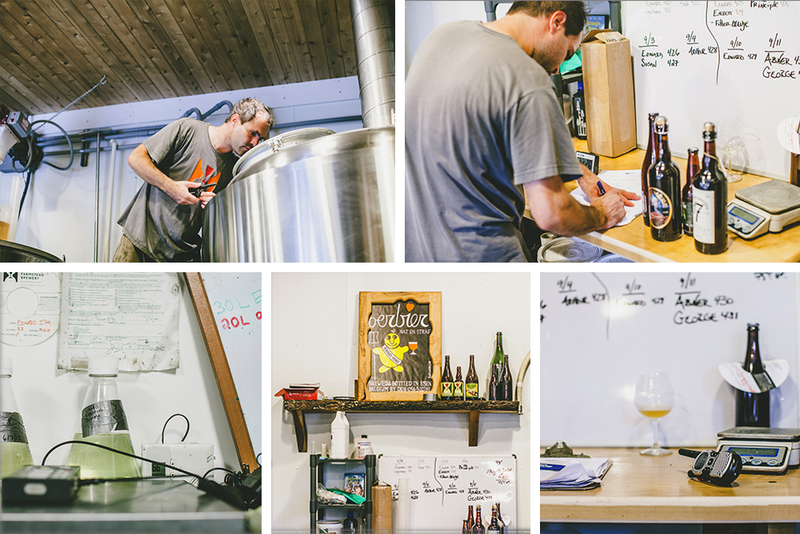 He has to work harder than any brewer I’ve ever met just to give himself a fighting chance. These beers aren’t a celebration of life as much as they’re a constant existential crisis from which Shaun himself is committed to emerging from whole. Shaun spent most of his life on the farmstead living in the same house that he has returned to after a stint working in breweries both stateside and in Europe. His parents live across the street, and other family members are just a short drive. But most of the people Shaun sees on a daily basis are coming from much, much further away. Today, I’m one of those people. 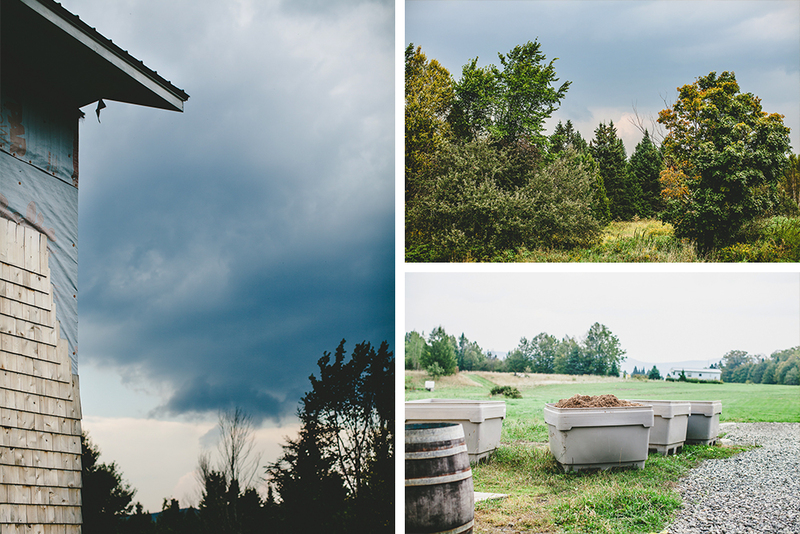 A drive through Quebec’s countryside, with stops at cider makers and Brasserie Dunham, brought me to the US/Canada border with only a couple hours of daylight left and a storm rolling in. Add to that a spotty GPS, and a growing disbelief that I was ever going to find a brewery this remotely situated almost had me turning around. But eventually, my Jeep crested the hill, and the Hill Farmstead mark rose as high on the barn as the valleys sank low beneath our tires. Only a handful of people were milling around the place, smoking cigarettes and waiting out their last couple beers before they could jump back in the car and schlep their growlers home for the night. The small crew announced last call and started mopping up. 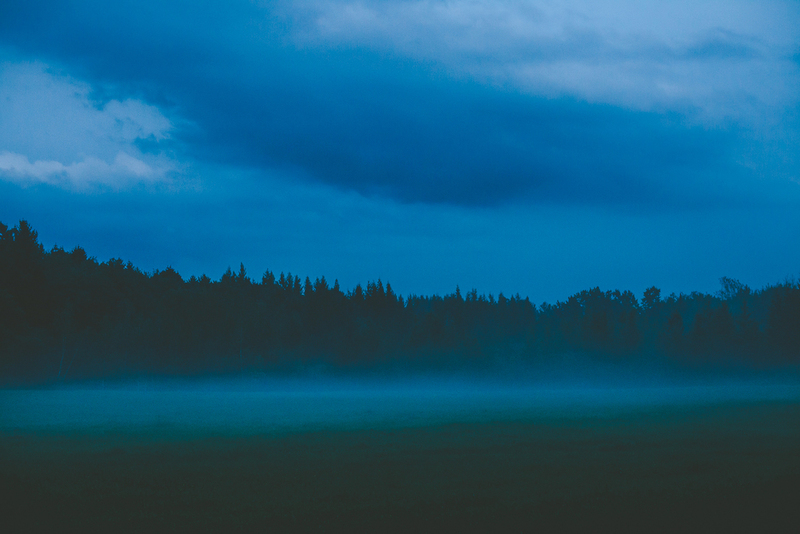 I found Shaun hunched over his computer with a kitchen timer at his right — his shoulders wet from the rain. “Eloi sends his regards,” I said. A puzzled look, and then a wicked shine pooled in his eyes as he recalled a summertime festival meeting between himself and the Brasserie Dunham crew. The barrel-aged Saison Framboise and some Unibroues went on the shelf next to his other prizes, the timer went off, and Shaun was consumed once again in the machine. He never fully returned. What I see in Shaun is something I see in a lot of people I knew growing up in Pennsylvania’s Appalachian Mountains. There, the work you do, and the quality of the execution matters more than the scale you can produce it at, or how many people it can reach. You and the world don’t owe each other anything of particular importance. There’s no anxiety or sleepless nights wondering how you’re going to meet anyone else's expectations other than your own. And in the end, trusting someone else to do the job right isn’t nearly as critical as trusting yourself to do it at all. American craft is going through an important shift where artisans who have prioritized the brewing lifestyle like Shaun has, are working in the same space as those who have chosen the brewing business. There is plenty of room for both of them. But Americans are generally uneasy about a lack of ambition when it comes to business — anything worth making is worth making a million times over, so it goes. Brewers that have spent time with some of Europe’s small-batch producers are returning with a different mindset altogether (Gerrit Lewis and Beejay Oslon from Pipeworks, and Fredrick Tunedal of Sweden’s Pang Pang Brewery come to mind). These curious upstarts don’t set out to own breweries as much as they’re attempting to carve out a role in their communities where they’re simply allowed to make beer for a living. It’s a delicate ecosystem. 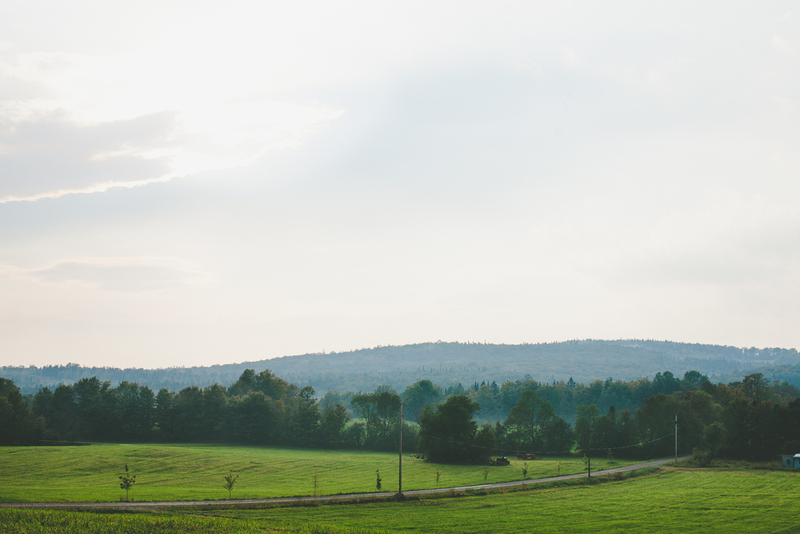 Driving back down the mountain, and up into the forests of Quebec as the night and fog roll in, I can’t help but ponder the future of a place like Hill Farmstead. So many people work hard to see their business grow. Others like Shaun work even harder to see their business matter. And that’s where the hustle comes from — the unending sensation that there is always more to be done, and done better. Shaun didn’t set out to establish an artisanal brewery in an idyllic setting with the hopes that beer geeks would set out on some Bacchus-conjuring pilgrimage to find his bottles. Although, that’s sort of happened. What he did do was set out to prove that you could do the job you want to do, where you want to do it, as long as your priorities are in order. If he’s right, it’s going to take an immense amount of work, and an unwavering pursuit of perfection — and he alone is going to have to be the one to do it, over and over again.